Shallow-water areas, including streams, rivers, lakes, wetlands and harbors. Often found at marinas, parks and other areas frequented by humans. Found year-round throughout the Chesapeake Bay watershed. Males and females have different patterns and coloring. 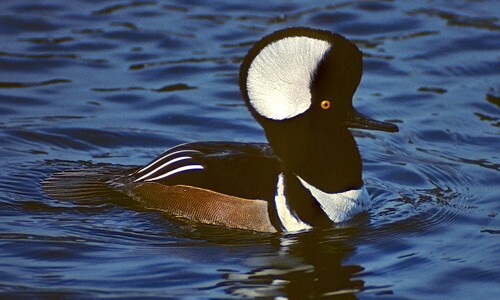 Males have an iridescent green head, a yellow bill, and a white ring around the neck. Their chest is chestnut brown and their sides are grayish. Females are mostly mottled brown with a brownish-orange bill and a dark stripe running through the eye. 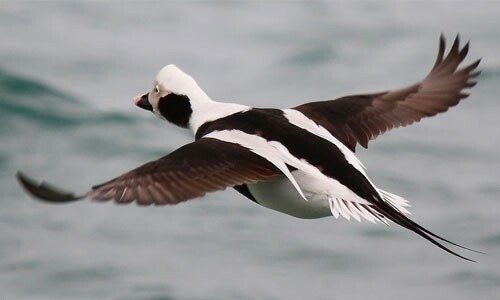 Both sexes have bluish or violet wing patches (called specula) bordered by black and white. Mallards grow to 23 to 25 inches in length with a wingspan of 36 inches. 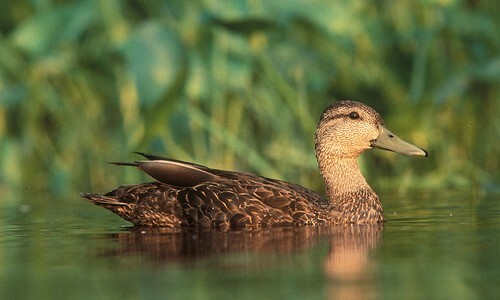 The mallard eats seeds, snails, insects, bay grasses and aquatic invertebrates. It feeds at the water’s surface or by “tipping up” its tail and submerging its head to reach food underwater. Mallards can be identified in flight by its green head (on males) and bluish or violet wing patch bordered with white. Females quack loudly. Males have a low call that sounds like kewk-kewk. Mallards breed mostly in the prairie pothole region of Canada and the Dakotas. Local populations breed in the Bay watershed. Nests are built on high ground near water. The female lays 8 to 10 pale, greenish eggs that hatch in 28 days. Ducklings follow the female into the water soon after hatching. They are immediately able to find and eat food on their own. Ducklings fledge within two months of hatching. Mallards are one of the most abundant waterfowl in the world. Very closely related to black ducks, it is not uncommon for mallards and black ducks to breed. This produces mallard/black duck hybrids that have physical characteristics of both ducks. Female mallards can be confused with black ducks. You can identify a female mallard by its lighter overall coloring. Mallards are also significantly more common than black ducks.